Violet Clara McNaughton was born in England in 1879 and eventually settled in Saskatchewan in 1909. In 1912 and 1913, she and her husband John spearheaded organization of the Grain Growers’ locals. She was instrumental to the founding of the Women Grain Growers in 1914, and served four years as that organization’s first President. In 1915, Mrs. McNaughton was the first woman elected to the SGGA board of directors. 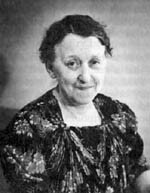 She helped organize United Farm Women of Alberta, Ontario and Manitoba and, in 1922 was the first woman on the executive of the SGGA. She retired from the SGGA board in 1925 and became the women’s editor of the Western Producer, a post at which she remained until 1952. Mrs. McNaughton died in 1968, one of the most influential women of her time.